4-year-old Manish, son of Raju M, has been diagnosed with a severe liver disease called Decompensated Liver Disease. Decompensated Liver Disease is a severe liver disease where the liver begins to deteriorate severely. The patient's stomach swells up and the eyes turn yellow. The patient also becomes a lot more susceptible to Jaundice. Manish is already in a critical stage as his stomach is very swollen. He has been advised to urgently undergo a liver transplant in order to treat his condition. 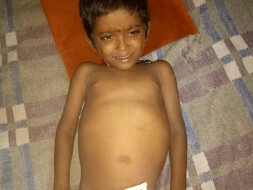 Unfortunately, Manish's parents do not have the necessary funds to afford the treatment and are scared that if they do not pay for his treatment they will lose him. Help raise funds for Manish's transplant. Your contribution can give him the treatment he deserves. Here's a quick update on Manish's update. He successfully underwent surgery and the mother was the potential donor. He is responding to the treatment and is doing well. We are happy to inform you that Manish has successfully undergone the transplant as is recovering well. His parents are very grateful for your support. We will keep you posted on his progress. 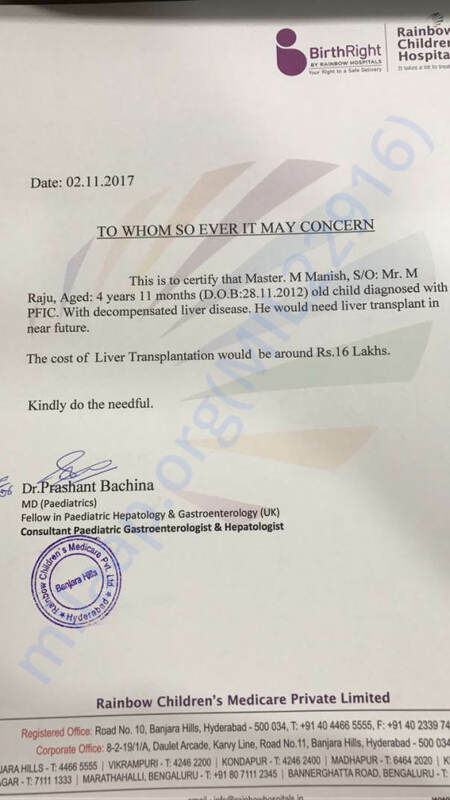 Manish is planned to get admitted sometime next week for the transplant. Doctors are yet to finalise a date based on what the Doctors decide after his check up.